VXG Player SDK is a set of tools for fast and convenient development of mobile applications for viewing various media streams like RTMP, HLS, RTSP, RTP, MMS, WebM, FLV, MP4, TS, and other network video formats and playback files with following formats: AVI, MOV, MKV, FLV, AVI, 3GP, 3G2, ASF, WMV, MP4, M4V, TP, TS, MTP, M2T, etc. The core of the SDK is the library for application development. Multicore decoding – support of the multiple processor cores for decoding. Multichannel support – simultaneous connection to multiple resources or multiple video channels and simultaneous video decoding. Live streams recording – special API to record streams into an mp4 file. Audio volume boost and volume detector – special API to increase audio volume above system ability and to detect max/min volume to avoid any audio clipping on raising volume. Pre-buffering data in paused mode – accumulation of media data in Paused mode to avoid clipping on further playback (audio mode only). Step 2: Create an empty file called license in your application folder assets and paste your license key into this file. See the picture below how it should look in corresponded test application \streamland_player. Providers notifies about results, errors and notifications using the “MediaPlayerCallback” callback. All messages are synchronous and provider waits until the application handles a message. 117 CP_DISCONNECT_SUCCESSFUL NOTIFICATION CP notifies that network source is disconnected successfully. 503 ARP_VOLUME_DETECTED NOTIFICATION ARP notifies that the volume detector has finished and app can get min and max estimated audio volume values. In case onPlaybackError() / CP_ERROR_DISCONNECTED / CP_ERROR_NODATA_TIMEOUT notification has received the closing procedure is not processed automatically, pipeline state is not changed, further playback goes on automatically when network connection has been restored (CP_CONNECT_SUCCESSFUL received). onPlaybackResumed() / CP_CONNECT_SUCCESSFUL occurs after successful restoring of network connection, playback continues automatically pipeline state is not changed. The following functions are members of MediaPlayer class. These functions should be used to playback network content and media files. Connect to a network server or open media file, create pipeline and playback media data. DataReceiveTimeout Reconnect timeout, SDK does reconnect if there is no data received during some time (milliseconds). Connect to network server or open media file, create pipeline and playback media data in Preview mode. Preview mode differs from normal: s/w decoding only key frames, real time render, no audio stream (only video). Upon successful completion OpenAsPreview() returns 0. Otherwise, -1 is returned. All errors are provided in callback status. Connect to network resource or open local media file, create pipeline, allocate resource and start playback in Preview mode. Upon successful completion, Pause() returns 0. Otherwise -1 is returned. All errors are provided in callback status. Change playback state from Play to Pause on all modules expect for network source module. Upon successful completion, PauseFlush() returns 0. Otherwise -1 is returned. All errors are provided in callback status. Pause playback and all modules expect for network module if player was in Play state. Network module works in this mode and puts data in video and audio buffers. Video frames and audio samples are skipped if buffers are full. Upon successful completion, getStreamDuration() returns file duration in seconds. Otherwise -1 is returned. All errors are provided in callback status. Integer value is returned. 0 – on successful completion, PLP_SEEK_COMPLETED notification will send on success. Otherwise – error result. Upon successful completion, getLiveStreamPosition returns Position object. first - dts of first segment in m3u8 list. last - dts of last segment in m3u8 list. current - dts of last downloaded packet in HLS stream. Time base is milliseconds. Function returns the Meta data of media file or network stream. Type – String, Format – xml. Provide the information about media file or network stream. comment any additional description of the file. composer who composed the work, if different from artist. copyright name of copyright holder. creation_time date when the file was created, preferably in ISO 8601.
date date when the work was created, preferably in ISO 8601.
disc number of a subset, e.g. disc in a multi-disc collection. encoder name/settings of the software/hardware that produced the file. encoded_by person/group who created the file. filename original name of the file. language main language in which the work is performed, preferably in ISO 639-2 format. Multiple languages can be specified by separating them with commas. publisher name of the label/publisher. service_name name of the service in broadcasting (channel name). service_provider name of the service provider in broadcasting. title name of the work. track number of this work in the set, can be in form current/total. Integer value is returned. 0 - on successful completion, PLP_SEEK_COMPLETED notification will send on success. Otherwise – error result. Get pre-buffering position in played media file. This function works only in case of file playback. Upon successful completion, getStreamPrebufferTime() returns pre-buffered position of played file/stream (in milliseconds). Provide the pre-buffered position that is played by player. rate - rate value (). Change spped of streaming on RTSP camera . This option works if RTSP protocol is used. No all cameras support scale option . This function works if player state is Pause. Error value is returned by function setRtspPlaybackScale. Upon successful completion, Close() returns 0. Otherwise -1 is returned. All errors are provided in callback status. Set video output mode for current player instance. isAspectRatioEnabled – set aspect ratio that is set in network stream, 1 – set aspect ratio that is set in network stream, 0 – resize picture on full screen. Upon successful completion, isAspectRatioEnabled() returns 0, otherwise -1 is returned. All errors are provided in callback status. UpdateView(1) sets aspect ratio or full screen mode. This function can be used during playback. UpdateView() function uses settings that are set in player config structure. Y position of output picture (in percent, 0-100%) player.getConfig().setAspectRatioMoveModeY(Y); // zoom and move modes are experimental functions, they may cause some issues. player.getConfig().setAspectRatioMode(5); // Zoom and move mode player. Set background color of player. clr – color in RGB format (ARGB is not supported). Upon successful completion, backgroundColor() returns 0, otherwise -1 is returned. All errors are provided in callback status. No value is returned by function setStreamPosition. Capture video picture from video stream. Upon successful completion, getVideoShot() returns VideoShot object. Provide the video shot of last render frame in format ARGB_8888. This function works in Preview mode only. Return bitrate of downloaded stream so application can estimate if network bandwidth is enough for defined stream. Provide the bitrate of captured stream (download speed) to estimate if network speed is enough to playback stream in real time. Return number dropped frames on render. Upon successful completion, GetDroppedFrame() returns number of dropped frame in render provider. Return fullness of inner buffers in pipeline so application. Detail information are provided for every buffer in video and audio pipeline. Return fullness of inner buffers in pipeline so application can estimate if device can playback data in real time or with latency (Video data only). Return fullness of inner buffers in pipeline so application can estimate if device can playback data in real time or latency. Upon successful completion, getDataBitrateOnSource () returns stream bitrate in kbps. Return what decoder (s/w or h/w) is used by player. Shows if h/w or s/w video decoder is used in player. int param; //0: get last stopped file. 1: get last started file. Retrieve a number of audio tracks. Returns a number of available audio tracks. AudioGetCount() retrieves a number of audio tracks. It can be used when player is in opened state only (PlayerState.Opened) or after notification PlayerNotifyCodes. PLP_BUILD_SUCCESSFUL. AudioSelect Select an audio track to play. track_i – the number of selected track, the value must be in the range of value has been returned by AudioGetCount(). AudioSelect(track_i) can be used also before opening of the player. track_i value is saved automatically into MediaPlayerConfig.setSelectedAudio(). This track will actually used after player.Open(). Retrieve a selected audio track. When startVolumeDetect() has finished ARP_VOLUME_DETECTED sent. Application can retrieve maximum and mean estimated audio volumes through getting the properties getPropInt(PlayerProperties.PP_PROPERTY_AUDIO_VOLUME_MAX) and getPropInt(PlayerProperties.PP_PROPERTY_AUDIO_VOLUME_MEAN). Application should first retrieve volume statistics through startVolumeDetect() and max_volume = getPropInt(PlayerProperties.PP_PROPERTY_AUDIO_VOLUME_MAX); mean_volume = setPropInt(PlayerProperties.PP_PROPERTY_AUDIO_VOLUME_MEAN). After all, set corresponded value volume_boost to avoid audio clipping in raising audio volume. For instance app obtains mean_volume=-27, max_volume=-4. It means that: The mean square energy is approximately -27 dB. The largest sample is at -4 dB, or more precisely between -4 dB and -5 dB. In other words, raising the volume by +4 dB (volume_boost=4) does not cause any clipping. Retrieves a number of subtitle tracks. Returns a number of available subtitle tracks. SubtitleSelect(track_i) can be used also before opening of the player. track_i value is saved automatically into MediaPlayerConfig.setSelectedSubtitle(). This track will actually used after player.Open(). SubtitleGetSelected() returns actually selected subtitle track. In case player is not in Opened state, SubtitleGetSelected() returns MediaPlayerConfig.getSelectedSubtitle() value. 0 - OK. Otherwise error. SubtitleSourceAdd(String path2) adds a path to subtitle source. Application can set up multiple external subtitle sources. After adding subtitle source, the player will increase the count of subtitle tracks (SubtitleGetSelected()) and select required track by SubtitleSelect() call. SubtitleSourceAdd() can be called in both before and after Open() call. Also these paths to external sources can be added through MediaPlayerConfig. subtitlePaths string list. Removes an external subtitle source has been added by SubtitleSourceAdd() function. Thumbnailer is a Class that provides the functionality to make thumbnails and stream information for local files and network streams. Smart searching is used to make thumbnails with maximum informativity. Following functions are member of Thumbnailer class. These functions should be used to get a thumbnail for file or network stream. Connect to network server or open local media file. ConnectionUrl – URL of network resource (RTSP, HLS, RTMP, MMS, UDP and so on) or full path of local media file. Class ThumbnailerConfig provides additional setting to open Thumbnailer. // Getframe is sync function and we read data from socket. Connect to network resource or open local media file, create pipeline, allocate resource. This function should be called before get Frame. Upon successful completion, getFrame returns ThumbnailFrame object. Provide the thumbnail for local file or stream in format ARGB_8888. Function returns the information about media file or network stream. Type – String, Format - xml. Provide the current state of Thumbnailer. Disconnect from server or close file and destroy all resources. Upon successful completion, Close() returns 0. Otherwise – ERROR is returned. Control mute and unmute on audio render. Set data receiver callback to get video and audio data. callback – SDK will call if there are any video frame or audio sample according defined mask. callbackMask – masks that set what data will be provided to application level. PP_CALLBACK_DATA_RENDERER_VIDEO_DATA(0x00000008) Provide video frames that come on video render in various formats: YUV, NV12 and other. Format depends from input stream, device, decoder and other. PlayerCallbackDataConfig config file to set cropping and other settings. Application sets callback to get video and audio data. Application can get encoded or decoded data. Return Data config that is used to set additional option to capture video. PlayerCallbackDataConfig set config for callback data. Raw video or audio data is provided if callback is defined on application level. To use callbacks below you need to set setOnDataListener with the appropriate PlayerCallbackDataMask first. Buffer 1 – Video buffer, data format is Video Elementary data. Buffer size is 8 MB for HD or lower resolution and 32 MB for UHD resolution. Buffer 2 - Audio buffer, data format is Audio Elementary data. Buffer size is 4 MB. Buffer 3 – Subtitle buffer, data format depends on subtitle type. Buffer size is 2 MB. Buffer 4 – Data buffer, data format depends on data. Buffer size is 1 MB. 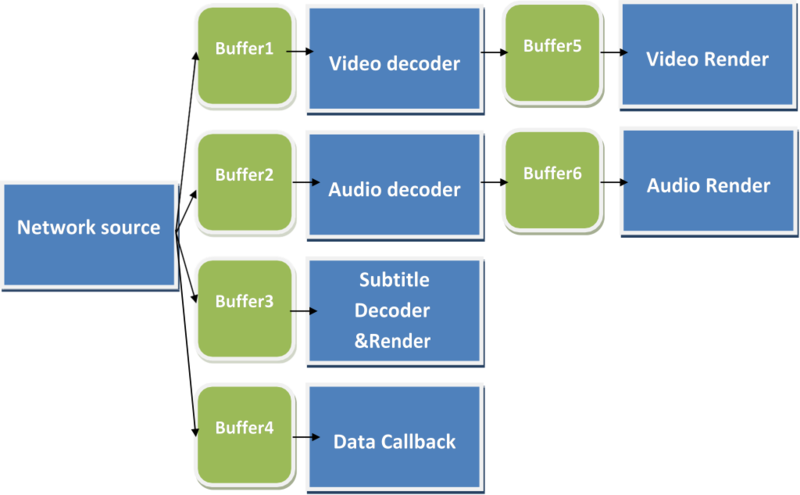 Buffer 5 – Video render buffer, index of decoded frame in case of h/w decoder and video frame in case s/w decoder. Buffer size for s/w decoder is 16 MB for up to HD resolution, UHD – 96MB. Buffer size for h/w decoder is 1 MB. 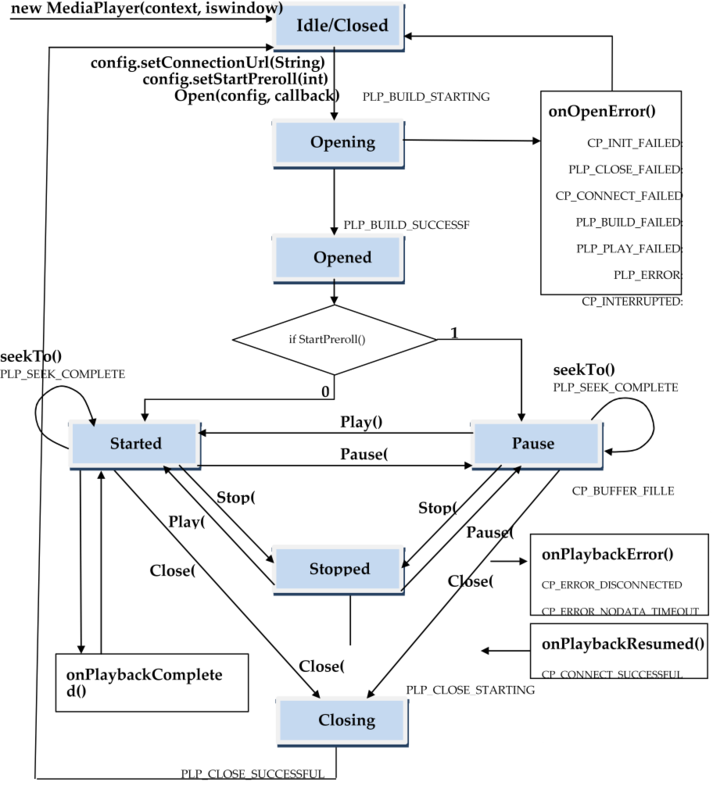 Buffer 6 – Audio render buffer, decoded sample, format PCM. Buffer size is 4 MB. Buffer sizes can be configured for custom platforms. 1 – Buffering on start of streaming and during the playback if data in buffer is less than threshold. The buffer size is estimated in bytes for all channels. Set buffering size in milliseconds. Default value is 1000 (1 seconds). Set buffering size in bytes. Default value is 0. Buffering on start of streaming. It means that data will be accumulated on start of streaming, the size of audio and video buffering is 1 second if PTS are correct. Buffering on start of streaming and buffering during playback if video or audio buffers underflow. It means that 1 Mbyte of all received data (video, audio and meta data) will be accumulated on start of streaming. The data will be buffered again during streaming if video or audio buffers become empty. Video and audio decoders and renders are paused during buffering. Return fullness of inner buffers in pipeline. Detail information are provided for every buffer in video and audio pipeline. int getBufferFramesSourceAndVideoDecoder(): Return number of frames between network source and video decoder. int getBufferFramesBetweenVideoDecoderAndVideoRenderer(): Return number of frames between video decoder and video render. int getBufferVideoLatency(): return latency by PTS between last received video frame by network source and last rendered video frame by video render. int getBufferAudioLatency(): return latency by PTS between last received audio sample by network source and last rendered audio sample by audio render. The simplest method to control buffering amd latency is: change playback speed and check buffering values. The sample function below shows how to control inner buffer using buffer state and playback speed. Function checks number frames and increase or decrease the playback speed. If sBackwardFormat is empty, then BackwardAudio is not supported by the camera. All commands are synchronous and it is better to use separate task and do not block UI thread. PanTilt_x,PanTilt_y - Pan and tilt speed. The x component corresponds to pan and the y component to tilt. speed_x,speed_y: Pan and tilt speed. The x component corresponds to pan and the y component to tilt.